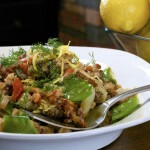 Toasted Quinoa Cabbage Salad - What the Forks for Dinner? 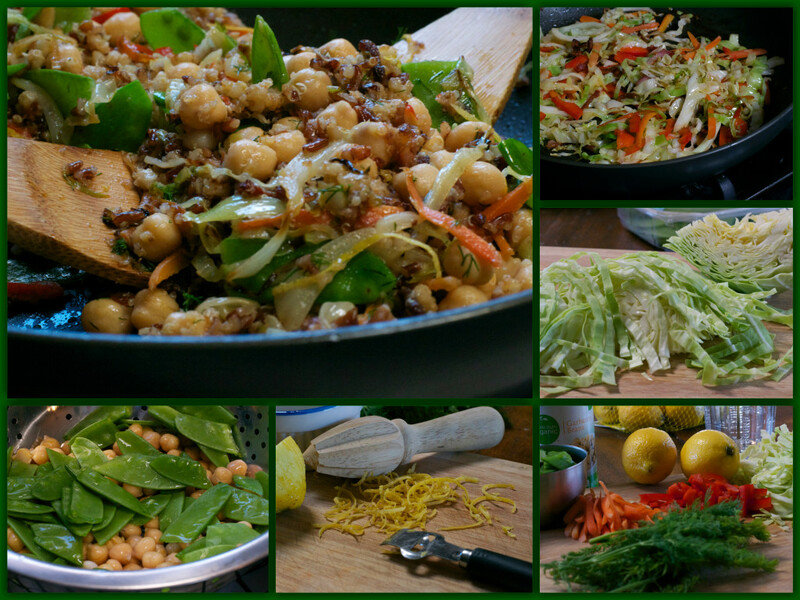 This salad was totally for me……..and it was damn good!!!! Truth be told Tim is not a quinoa lover. I adore it….I would eat it all the time. I have found it frozen at my local grocery store, which I should give a heads up to Kroger…What the “Forks” for Dinner’s, go to grocer. The frozen quinoa comes in a steam-able bag and is perfect for dishes that call for quinoa….pop it in the wave and a couple of minutes later…ta da…..recipe ready. I have been eating a lot of chickpeas …aka garbanzo beans lately. They have a kinda nutty taste and a texture thats buttery, but starchy too. Plus they have a ton of fiber and protein that makes them perfect for a meatless dish. Not this dish…..it has bacon….yum!!! The dish has bacon because it has cabbage, and you need bacon with cabbage…..just saying! The other ingredients, were things I had left over from other dishes. Thats the tough part of buying groceries for two, you have stuff left! So, in my effort to be thrifty, I wanted to use up, some carrots,red pepper, and snow peas. They melded really well with the quinoa, bacon, and cabbage. 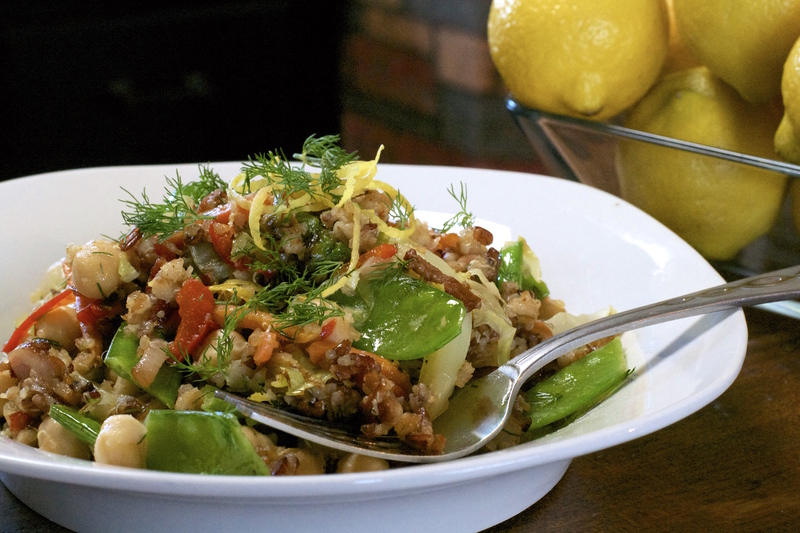 A little lemon zest and juice for a bright tartness, and dill for that springtime touch…..Toasted Quinoa Salad. 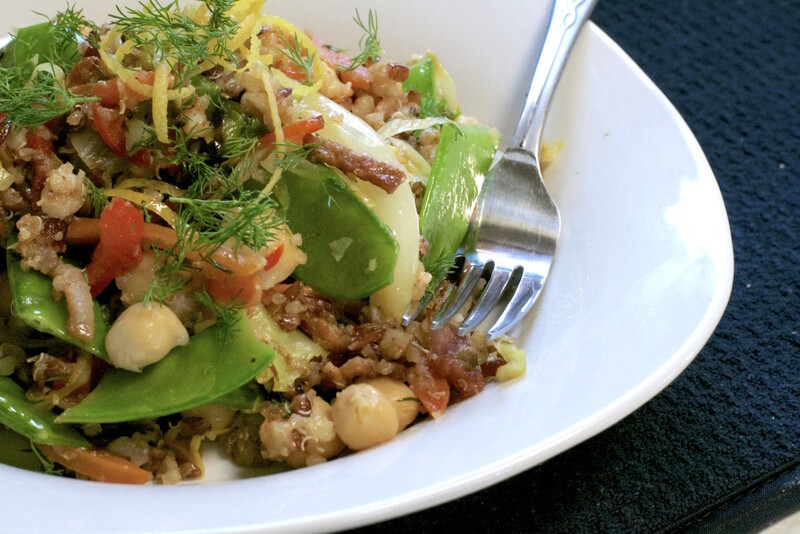 You can serve this either warm or cold…..perfect springtime salad for lunch or a light dinner! Cook bacon in a large nonstick skillet over medium-high heat until crispy. Remove, reserving the bacon fat. Add cabbage, red pepper, and carrots cooking until cabbage is limp. Add remaining tablespoon oil to skillet. Add quinoa, and raise heat to high. Cook, stirring occasionally, until quinoa is toasted and crispy, about 8-10 minutes. Remove from heat. Add chickpeas, snow peas, bacon,lemon zest and juice, and toss to combine. Season with salt and pepper. Stir in dill.